See past news and announcements from PACE. PACE has released a new white paper, ‘Infogagement: Citizenship and Democracy in the Age of Connection’. The paper grew out of our ‘Information and Engagement Project’, a two year conversation at PACE that involved multiple convenings across the country and dozens of interviews with leading thinkers and practitioners in the fields of journalism, civic technology and public engagement. In these conversations we explored how new and old forms of information delivery could encourage more civic engagement, particularly among previously disengaged populations. What we discovered was a complex set of cause and effect relationships that creates an image of public life ‘that has become something more like a Jackson Pollock painting’. The project was ably directed by, and the paper was written by, Matt Leighninger, the Executive Director of the Deliberative Democracy Consortium (DDC). The effort was financially supported by PACE members the Rita Allen Foundation, the Case Foundation, the John S. and James L. Knight Foundation and the Rockefeller Brothers Fund. The paper is available as a free pdf download at the PACE website. June will be a busy month for PACE Executive Director Chris Gates, with five major events taking place. First, Gates will meet with other leaders of the service community in Gettysburg, Pennsylvania June 4-6 to hear about the progress of the Aspen Institute’s Franklin Project, an effort to make service a more integral part of the lives of all American youth. Then Gates, who has been working closely with the staff of the Council on Foundations to design two democracy-related sessions at their upcoming annual conference in Washington, DC, will moderate both a session on the upcoming 2014 midterm elections and a conversation about campaign finance reform and the IRS issues around advocacy and speech in the non-profit sector at the COF conference. Shortly after that, on June 11th and 12th, the board and members of PACE will gather for their summer board meeting in Washington, DC to update each other on their work, hear updates about PACE work and make plans for the remainder of 2014. Next Gates will head to Atlanta for the annual National Conference on Volunteering and Service, sponsored by Points of Light. As a member of the Reimagining Service Council Gates will be involved in several conversations there about efforts to rethink how the non-profit world uses volunteers to accomplish their goals. Finally, Gates has been invited to participate in the Clinton Global Initiative-America meeting in Denver, Colorado on June 23-25. Gates will serve as a resource person in the ‘Empowering Opportunity Youth’ track and be a voice for the perspective that PACE has championed for several years, that service can provide a civic path out of poverty for disconnected, disadvantaged and disengaged youth. The Chronicle of Philanthropy has recently published ‘Foundations Must Rethink Their Ideas of Strategic Giving and Accountability’, an article that was co-authored by PACE Executive Director Chris Gates and Kettering Foundation Program Officer Brad Rourke. The article is based on the upcoming PACE white paper, ‘Philanthropy and the Limits of Accountability: A Relationship of Respect and Clarity’ authored by Rourke. PACE and Kettering have been working together for the past two years to better understand how the trends of ‘accountability’ and ‘transparency’ might impact the field of philanthropy, and how philanthropy might respond. The paper was informed by a series of interviews and convenings, a distinguished group of foundation executives, non-profit leaders and thought leaders in the philanthropic and social sectors. Many of their insights and questions are reflected in the paper, which will be released soon as a free pdf download on the PACE website, www.pacefunders.org. To read the Chronicle article, click here. Chris Gates, the Executive Director of PACE, attended the recent meeting of the Bipartisan Polcy Center’s Commission on Political Reform at the John F. Kennedy Presidential Library in Boston. The Commission, co-chaired by a bi-partisan group of former congressional leaders including former Maine Senator Olympia Snowe, was launched last year to understand the causes and consequences of America’s partisan political divide and to explore possible electoral and congressional reforms that would improve the function of our nation’s democracy. This gathering was the last of four ‘national conversations’ that were held across the country, the Commission will issue its final recommendations at a public event in Washington, DC on June 24th. For more information go to www.bipartisanpolicy.org. During its year end board meeting in Washington, DC the board of PACE elected officers for 2014. Continuing as president is John Dedrick of the Kettering Foundation. New as vice president is John Sirek of the McCormick Foundation. David Egner of the Hudson-Webber Foundation and the New Economy Initiative continues to serve as treasurer. And Kate Ahern of the Case Foundation is the board secretary. We are also happy to welcome the Community Foundation for the National Capital Region, the Vermont Community Foundation and the Woods Fund of Chicago as the newest members of PACE. Two PACE research projects will release their results in early 2014. The first will be the white paper that emerged from our Information and Engagement project, which was directed by Matt Leighninger of the Deliberative Democracy Consortium. Matt’s paper, ‘Infogagement: Citizenship and Democracy in the Age of Connection’ was the result of over a year’s worth of interviews and convenings with experts in a variety of fields, including traditional journalism, civic journalism, storytelling, social media, organizing and technology. We will release both the full paper and an executive summary, both designed to spur conversation about how different approaches to information dissemination can lead to more, and better, civic engagement. The second project, Accountability, Transparency and Philanthropy, was directed by Brad Rourke of the Kettering Foundation. Brad’s paper, ‘A Relationship of Respect and Clarity: Philanthropy and the Limits of Accountability’ was also the result of dozens of interviews and four convenings which explored how the transparency and accountability movements were affecting the field of philanthropy. We hope this paper will spur a lively conversation within the philanthropic community about how these movements will impact our work in the future. Chris Gates, the Executive Director of Philanthropy for Active Civic Engagement, and Nick Penniman, the Executive Director of Fund for the Republic, recently co-authored an article, ‘A Second Front for Democracy Reform’, which calls for a new trans-partisan effort to repair our ailing political process. In their article they make the case that the issues of money in politics, low voter turnout and a lack of faith in the political process should united Republicans, Democrats and Independents alike in an effort to make our process more fair, inclusive, representative and equitable. They also make the case for philanthropy to play a leadership role in bringing all sides together to find common ground. Click here to read the full article. PACE is happy to welcome four new philanthropic leaders to the PACE Board of Directors. They are David Bley, Director of the Pacific Northwest Initiative at the Bill and Melinda Gates Foundation in Seattle, WA; Cris Doby, Program Officer of the C.S. Mott Foundation in Flint, MI; Mary Manuel, Managing Director of the McKay Foundation in San Francisco, CA; and Catalina Ruiz-Healy, Vice President of the Rappaport Family Foundation in San Francisco, CA. We are excited to bring these fresh voices and diverse perspectives to our work. Sally Prouty, the former long-time head of The Corps Network, has spent the last year working with PACE as our inaugural PACE Fellow. In this capacity she has assisted PACE Executive Director Chris Gates in the organization’s efforts to energize and reprioritize the service movement around the need to use service as a tool to change the lives of disadvantaged and disengaged youth. For the last three years, PACE has led an effort called ‘Civic Pathways Out of Poverty and Into Opportunity’ which grew out a white paper we published in 2010 with the same title. Sally has been an invaluable ally in our efforts to move this big idea forward. Sally has written an essay for PACE, “Civic Service: Providing an ‘Opportunity’ for Millions of Youth” which distills some of the lessons she has learned from nearly three decades of work in this space and provides some advice about what the field of service should be thinking as it looks to the future. PACE and the Kettering Foundation continue to move forward with their ‘Accountability and Philanthropy’ project. Under the guidance of project director Brad Rourke, we have have held two convenings, one in Washington and the other on the Kettering campus in Dayton, bringing together leaders of the philanthropic community with experts in the fields of transparency and accountability. We have one additional convening planned where we will ask non-profit leaders, the grantees of foundations, their views on this topic. Rourke has also been conducting individual interviews with a diverse group of thought leaders who are bringing a well-rounded perspective to our efforts. We hope that the white paper will be available later this spring and plan to use it’s release to catalyze conversations in the philanthropic and non-profit space about this important topic. If you are interested in being a part of the dissemination effort for the paper, we ask that you email Chris Gates, the Executive Director of PACE, at cgates@pacefunders.org. At the December 2012 PACE Board Meeting in Chicago, the Board chose new officers for the coming year. Our new Board president is John Dedrick, Vice President of the Charles F. Kettering Foundation in Dayton, Ohio. Dedrick replaces Ben Shute Jr. of the Rockefeller Brothers Fund who served as Board president for the previous three years. The PACE board and membership thank Shute enormously for the leadership and wisdom he provided the organization during his tenure as the head of our board. Paula Ellis of the Knight Foundation remains as vice president of the Board and Michael Smith of the Case Foundation remains the Board secretary. Replacing Dedrick as the Board’s treasurer is David Egner, CEO of the Hudson-Webber Foundation in Detroit. Earlier this year, PACE and the Knight Foundation gathered local and national leaders for a day-long conversation in Detroit to exchange ideas for how we better engage communities in our increasingly connected, yet still fragmented world. The insights shared through the TED-style learning event were invaluable, and we have collected them in a new report, Connected Citizens Detroit: A Snapshot of Civic Engagement. While many of the lessons center on Detroit’s growing community of social entrepreneurs, we know they will resonate with all of those who, like us, are continually searhing for new ways to help communities shape their futures. PACE has recently relocated it’s offices in Washington , DC. When we first moved to Washington at the beginning of 2012 we chose to locate within the Points of Light Civic Engagement Hub with 15 other national organizations doing work in the civics/service space. Unfortunately Points of Light lost their lease on the space and so all of the organizations have spent the last several months finding new office space. We are happy to report that PACE has made the decision to keep our close relationship with the National Conference on Citizenship intact and so both PACE and NCoC have moved into the offices of the Community Foundation for the National Capital Region at 15th and M Streets. The staff of the community foundation has been incredibly welcoming and accommodating and we are very happy to make our new home there. June 1, 2012 — PACE, Philanthropy for Active Civic Engagement, announced its inaugural ‘PACE Fellow’ today. Sally Prouty, the immediate past President and CEO of The Corps Network, will serve for the next six months as a Fellow at PACE and provide thought leadership and guidance on their ‘Civic Pathways’ project. The PACE ‘Civic Pathways’ project was catalyzed in 2009 by the Bill and Melinda Gates Foundation, the WK Kellogg Foundation, Open Society Foundations and the New World Foundation. In the fall of 2010 this collaborative effort produced a major white paper, ‘Civic Pathways Out of Poverty and Into Opportunity’, that made the case for viewing the field of service in a very different light, as a ‘civic pathway’ that can turn around the lives of disengaged and disadvantaged youth. PACE continues to have an active voice in the national conversation about the future of the field of service and in advocating for this new and innovative approach. Prouty was invited to serve as the inaugural PACE Fellow based on her long standing commitment to the field of service and to the concept of focusing service and civic engagement on workforce development goals and post-secondary achievement for low-income youth and young adults. She served for almost a decade at the president and CEO of The Corps Network (TCN), where she led work focused on assuring program quality and advancing partnerships in support of service and conservation corps. TCN promotes service as a strategy to revitalize communities, preserve and restore the environment, prepare young people for responsible and productive lives, and build civic spirit through service. As the joint forces of accountability and transparency overtake field after field–from politics, to government, to business, to nonprofits—some are now wondering what the accountability movement might mean to the field of philanthropy. Is it appropriate for philanthropy to become more publically accountable? Does accountability to the public or the field being served outweigh the legal accountability to the founding intention of a foundation? Do the tax benefits associated with philanthropy dictate a different level of transparency about how decisions are made? PACE and the Kettering Foundation will spend the next two years exploring these topics through a series of conveneings, a survey of the literature and interviews with thought leaders, which will lead to the development of a white paper which will summarize what we’ve learned and heard. We are happy to report that Mimi Clarke Corcoran, Director of the Special Fund for Poverty Alleviation at Open Society Foundations in New York has joined the PACE Board of Directors. We are also happy to report that the Omidyar Network has become a member of PACE. Our main contact at Omidyar will be Joe Goldman who works out of their new Washington, DC office. Jim Marks of the Greater Milwaukee Foundation has retired at the end of 2011 and has thus left the PACE Board. We thank Jim for his many years of board service, and in particular for his service as the Treasurer of our board and a member of our Executive Committee. We’ll all miss Jim’s wisdom and perspective in our board deliberations. We are also happy to report that John Dedrick of the Kettering Foundation has agreed to step into Jim’s role and is the new Treasurer of the PACE Board. The board of PACE recently made the decision to relocate it’s office from Denver, Colorado to Washington, DC in the first quarter of 2012. Washington is a place where many of our partner organizations are headquartered and many of our friends and colleagues do their work, and 2011 required significant and regular travel to both Washington and New York as we have expanded our portfolio of collaborations and partnerships. We are excited to make this move and look forward to the new opportunities it will present our organization. Chris Gates, the Executive Director of PACE, has joined the board of Mobilize.org. Mobilize empowers and invests in Millennials to create soltions to social problems, and in doing so, strengthen America’s democracy. Washington, D.C. – Mobilize.org announced Monday the addition of three new members of its Board of Directors: Crystal Carson, Chris Gates and Marshall Roslyn. Chris Gates, is the Executive Director of Philanthropy for Active Civic Engagement (PACE). PACE is an affinity group of the Council on Foundations and serves as a learning collaborative of funders who do work in the fields of civic engagement, service and democratic renewal. Gates previously served as President of the National Civic League, the nation’s oldest good government organization, and is an elected Fellow of the National Academy of Public Administration. His extensive experience and leadership in community organizing and philanthropy makes him a powerful asset to Mobilize.org’s engagement model. Marshall Roslyn, an education entrepreneur and Director of Business Development at SchoolTube, has a rich background in finance, venture capital and entrepreneurship. He was an early advocate at Room To Read, the leading non-profit organization focused on literacy and educational gender inequality in developing countries, and after starting his career in finance, continued to follow his passion for improving education through his role as a Principal at LearnCapital, an education-focused venture capital firm and investor in SchoolTube. Mobilize.org would like to welcome him to the Board of the Directors where his diverse background will provide new perspective to the organization. Crystal Carson, joins the board as the first Millennial Voice representative. A newly created seat on the board of directors reserved for a young leader who has gone through a Mobilize.org program and can provide a first hand perspective from the vantage point of a participant. Carson was a Target 2020 North Carolina Participant and Fellow, and who recently graduated from Central Piedmont Community College in Charlotte, North Carolina with her Associates in Science. She will be transferring to a four-year University in the Spring. A Millennial, Carson works full-time and goes to school part-time in order to complete her education. Mobilize.org is proud to have her join our Board of Directors where she will represent the direct impact of Mobilize.org’s work. Mobilize.org empowers and invests in Millennials to create and implement solutions to social problems. Utilizing technology and social networking to connect Millennials on and offline, Mobilize.org convenes Millennials from around the country to discuss issues impacting the Millennial Generation and to develop sustainable solutions to address them. Mobilize.org believes that in order to create long-term, sustainable and community based solutions to the challenges facing our generation, Millennials must authentically engage their peers in identifying problems, proposing solutions, and most importantly, must work together to implement these solutions on their campuses and in their communities. Chris Gates, the Executive Director of PACE, has joined the board of Public Agenda. Public Agenda is a New York based public opinion research and public engagement organization founded in 1975 by Dan Yankelovich and Cy Vance. More information on Public Agenda and this news is below. If your child’s school persistently received a failing grade from its district, would you feel ok about it closing down? Are you more confident that national and state governments are using tax dollars wisely because they release data from that spending online? If these accountability measures don’t make you more confident in institutions and their leaders’ decisions, you’re not alone. A thought-provoking new study from Public Agenda and the Kettering Foundation sheds light on why so many Americans remain disappointed with our nation’s institutions, despite considerable efforts by institutions in the public and private sector alike to build confidence by adopting tougher accountability measures. Don’t Count Us Out: How an Overreliance on Accountability Could Undermine the Public’s Confidence in Schools, Business, Government and More presents startling evidence that the public and leaders hold vastly different ideas about what it even means to be accountable. While many leaders believe that transparency and data help build public trust, this small-scale pilot study suggests that many typical Americans are deeply skeptical about the accuracy and importance of quantitative measures. Moreover, most believe that ethics and responsiveness matter as much as or more than rules and benchmarks. Many also argue that accountability is not the job of leaders alone; it is the public’s responsibility as well, and that our institutions will not work well until leaders, individual employees, consumers and voters all behave more responsibly and with more concern about what their actions and decisions mean for others. As the report points out, while accountability strategies may be effective management tools, “they fall short in addressing the public’s most potent concerns. At best, they strike much of the public as complicated and perhaps marginally informative. At worst, they risk pushing the public and leaders even further apart.” What can leaders do to address this possibly corrosive accountability gap and avoid harmful crosstalk? These findings have a real and pressing significance to both the public and leaders, including philanthropists, educators, government officials and health professionals. Read more about the report’s findings and methodology here. Three case examples in education, business and healthcare providing concrete illustrations of how the disconnect plays out time and again in America. A detailed methodology section describing how the research was conducted and what can be generalized based on the evidence. Join in on the conversation about accountability. Share your thoughts on our Facebook page, or weigh in on Twitter. Public Agenda welcomes two new talented members to our Board of Directors: Norton Garfinkle is an economist, entrepreneur and democracy advocate. He is the Chairman of the Future of American Democracy Foundation, as well as Senior Editor of the Yale University Press series on the Future of American Democracy. Chris Gates is an expert in civic engagement and philanthropy and the Executive Director of Philanthropy for Active Civic Engagement (PACE). PACE, an affinity group of the Council on Foundations, is a learning collaborative of American foundations that fund work in the fields of civic engagement and democratic practice . Chris was also the president of the National Civic League for eleven years. We look forward to the many assets Norton and Chris will bring to the organization. Additionally, Mitchel Wallerstein, president of Baruch College, former dean of the Maxwell School of Citizenship and Public Affairs, and Public Agenda board member since 2008, has stepped into the role of Chairman of the Executive Committee. Mitch is not only a leader in higher education but also a social scientist and former member of the Department of Defense. As Executive Committee Chairman, he replaces Lloyd Morrisett, chairman emeritus of Sesame Workshop and retired president of the Markle Foundation, who will remain on the Public Agenda board. For a complete list of Public Agenda’s board members, please refer to the list on our website. We are looking for experienced professionals to join both our research and public engagement teams in New York City. To view the job descriptions and apply, click here. The Frontiers of Democracy conference took place at Tufts Medical School in Boston, Massachusetts on July 21-23, 2011. A total of 117 people attended, ranging from high school and college students to senior professors and CEOs of important civic organizations, coming from as far as Germany, California, and Florida. The conference was co-sponsored by The Deliberative Democracy Consortium, The Democracy Imperative, Philanthropy for Active Civic Engagement (PACE), and Tisch College of Citizenship and Public Service at Tufts. It was organized by Peter Levine of CIRCLE/Tisch College, Nancy Thomas of TDI, Karol Soltan of the University of Maryland, and Matt Leighninger of DDC. Struggles for diverse, equal, and inclusive civic engagement. Believes that “engagement” means more than just voting, but must also encompass better ways of talking and listening with fellow citizens. Yet is not satisfied with deliberation alone but wants to connect it to action, work, co-creation, “civic artisanship,” and power. Seeks innovative forms of democracy (“not your grandfather’s civic engagement”): hence the conference track on engaging the online public. Creates spaces for people to make their own decisions and to set their own goals and values, and is therefore drawn to the ideal of “neutrality”–but is also committed to values such as equality and diversity. Hence our conference track on the dilemmas of neutrality. Seeks to reflect on practice and to bring ideas and ideals into the real world: hence our track on theory and practice. People generally liked the conference, with 61% saying it was either excellent (17%) or very good (44%). More people (84%) said the set of people who attended was either excellent or very good. Large majorities said that they would try to attend again and would recommend it to others. Most people provided examples of how they would apply what they learned to their work, and these answers were wonderfully diverse. But there were also critical responses to the whole conference and to the various “tracks.” More than one third said they did not have a clear idea of the conference’s purpose before they arrived. Some said their own groups struggled, were rushed, or had ill-defined goals. We conclude that convening this type of group is valuable, but the structure of the conference could be improved next time. We are certainly open to ideas for organization and for specific themes. On the first morning, the “Frontiers of Democracy Home Movie” (link at right), produced by Matt Leighninger, introduced the main themes and questions of the conference, using a mix of serious footage and small children saying funny things. Participants then began working in the three conference tracks. The results of these conversations were made available online in the form of a PrioritySpend poll (thanks to Ron Lubensky of Deliberations Australia). Each track was asked to come up with some ‘key insights’ – these ranged from overarching consensual statements to practical suggestions to further questions for the field. Both conference participants and others who followed the conference online were invited to vote and comment on the key insights from the three tracks. Those who chose to comment online were a diverse array of public officials, professors, foundation executives, and other leaders. 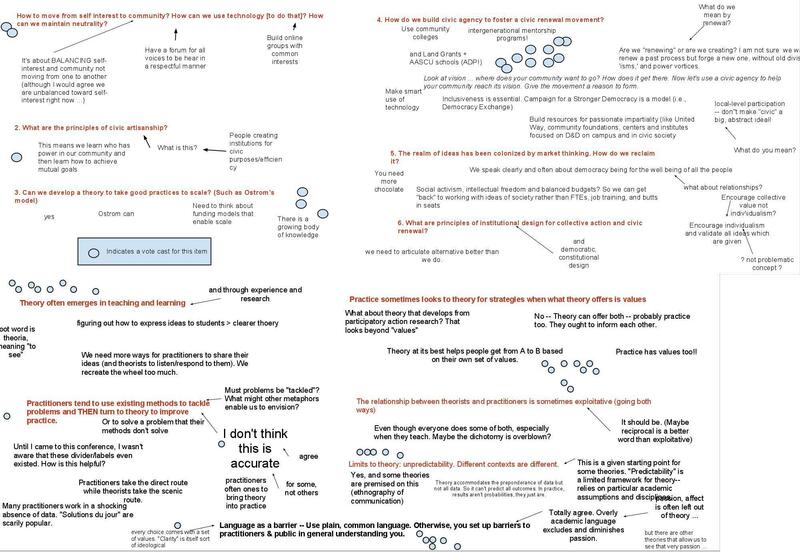 The questions and statements generated by each “track,” the public votes on those insights, and some interesting written comments, are collected here (PDF). The statements by the “Theory and Practice” track—along with other people’s written responses, are available online here (JPG). The report of the “Neutrality Track” is here. Some additional resources on neutrality are collected here. Votes and comments on the statements produced by the “Online Engagement” track are here. But we did witness a great deal of learning, network-building, and productive mental and emotional struggle. To name one example, we had intentionally focused on the Nobel-Prize-winning theory of Elinor Ostrom because it is rich with possibilities for civic action and has been developed in close partnership with practitioners. Yet Ostrom’s work is not about deliberation nearly as much as it is concerned with changing the incentives for investment and consumption. If you are a deliberative democrat–like the majority of conference attendees–your ideal may be a room full of citizens talking and listening. If you are an “Ostromite,” you may think instead of municipalities, firms, and public boards negotiating contracts to govern the use of scarce water across the Los Angeles basin. And yet deliberation can play an important role in such work; and getting people to deliberate is a collective-action problem for which Elinor Ostrom proposes solutions. So the potential is great for Ostrom’s economic theory to enrich deliberative democracy, and vice-versa, in both research and practice. Such are the exchanges and collaborations that I believe we began to build together at Frontiers. The board of directors of PACE has recently selected a new set of officers. Ben Shute of the Rockefeller Brothers Fund is the new board Chair, Paula Ellis of the John S. and James L. Knight Foundation is new board Vice Chair, Jim Marks of the Greater Milwaukee Foundation was reelected as Treasurer and Michael Smith of the Case Foundation is the new Secretary. Also, we are happy to announce that Dr. Colin Greer, President of the New World Foundation in New York, has joined the board of PACE. PACE is a learning community of funders doing work in the fields of civic engagement, service and democratic practice. Formerly known as the Grantmakers for Community and National Service, PACE was created five years ago to bring new philanthropic focus to emerging civic engagement strategies that strengthen our communities and our democracy. For more information about PACE or this paper contact Chris Gates, Executive Director of PACE at cgates@pacefunders.org, or go to www.pacefunders.org. It has been a busy month for PACE, while we are in the final stages of completing our “Civic Pathways Out of Poverty” white paper, we were also involved in three other significant efforts. From September 9th to the 12th I participated in the eighth annual Interdependence Day meeting, this one held in Berlin, Germany. Interdependence Day is an international effort begun by Ben Barber of Demos to promote the notion of global interdependence and is always held on the anniversary of 9/11. Next year, on the 10th anniversary of 9/11, the Interdependence Day events will be held in and around New York City. My talk was on the topic of political will and how citizens were motivated to action in the United States. The international participants were particularly perplexed about the lack of action around issues that they deemed ‘obvious’, like global warming. It was difficult for them to understand that in the US, both sides cite their own sets of facts, which can leave the public perplexed and sometimes paralyzed, as they try to decipher conflicting claims of ‘fact’. The next week, PACE, along with the Case Foundation and the National Conference on Citizenship, organized the Civic Innovators Forum, a day-long conference held at the Newseum in Washington, DC. This meeting served as a pre-conference to the annual National Conference on Citizenship that was held at the Library of Congress the next day. Our friends at Case, led by Michael Smith, organized the morning panels around citizen-centered solutions and prize philanthropy. We then heard from Stan Litow of the IBM Foundation about their upcoming service jam and from Andrew Rasiej, the founder of the Personal Democracy Forum, about his concept of ‘WeGovernment’. Then PACE was responsible for the afternoon sessions, which all grew out of the work that we have done over the past year on the relationship between philanthropy and the executive branch around the issues of service and civic engagement. Our first panel was moderated by Jean Case of the Case Foundation and featured the lead civic engagement ‘gurus’ of the past three presidential administrations. We were very lucky to have Gregg Petersmeyer, Shirley Sagawa and John Bridgeland join us for what was an exceptionally honest and thoughtful conversation. In a time of political rancor and overheated rhetoric, it was inspiring to hear these three talk about how much they had learned from each other and how hard they had worked to build on each other’s efforts. We then had Brad Rourke, the author of our PACE white paper on these ‘Evolving Relationships’, talk about his research and perspective. We finished with a panel that I moderated, talking about the current relationship between philanthropy and the administration on these issues. We were privileged to have Sonal Shah, the Director of the White House Office on Social Innovation and Civic Participation, Steve Gunderson, the CEO of the Council on Foundations, and Peter Levine, the Director of CIRCLE, join us for what was an incredibly interesting and informative conversation that both described the current complex relationship and explored how it might work even better in the future. Finally, last week we co-hosted the second meeting of the Intermountain West Funders Network, which was held on the campus of the Aspen Institute in Colorado. This is a joint effort of PACE and The Funders’ Network for Smart Growth and Livable Communities (TFN) that grew out of our joint conversations about the critical role that civic engagement plays in growth and development issues. With the support and encouragement of PACE and TFN member Bill Roper of the Orton Family Foundation, we have been working over the past year to see if we can develop a regional funders network in the Rocky Mountain West that focuses on the nexus between civic engagement and growth and development. Our first meeting was held in Santa Fe this past April and there was enough interest to justify this second meeting, a three day gathering. There is clearly some desire to move this effort forward but not yet a clear focus on what that will look like. We had good representation from foundations across the region, particularly those from the community foundation world who are really at the forefront of this conversation in many cities. If you have any questions about any of these projects, drop me an email and I’d be happy to get you more information. Nicole Gallant, Programme Executive at The Atlantic Philanthropies and member of the Board of Directors of PACE, has been named the new Director of Learn and Serve America and Strategic Education Advisor at the Corporation for National and Community Service. Patrick Corvington, CEO of the Corporation, made the announcement in a speech marking the one year anniversary of the passage of the Kennedy Serve America Act. Civic Pathways out of Poverty and Into Opportunity is an inclusive field-wide dialogue focusing on the ways in which civic engagement and national service expansion strategies can better serve as pathways to workforce development and post-secondary achievement for low-income youth and adults. Commissioned by Philanthropy for Active Civic Engagement (PACE), Marga Incorporated is engaging diverse stakeholders, including experts and leaders in the fields of civic engagement, national service, workforce development, community organizing, education and youth development – along with youth themselves – to bring new civic pathways out of poverty and into opportunity to fruition. To generate dialogue, the research (40-50 interviews and one survey of the field) and two convenings will culminate in a white paper identifying promising practices and a graphical map of potentially fruitful civic pathways. Developing a next generation of social sector leadership that reflects the communities in which they work. The lessons from this process are intended to inform the work and perspectives of participants and stakeholders. They will be shared across a number of networks and venues, such as the annual National Conference on Service and Volunteering, PACE sponsored events, and others. Our approach to identifying pathways consists of assessing the landscape of service, widening the impact of and approaches to service, and engaging strategies that move service in the direction of the four previously described areas. As a part of our assessment, we are focusing on aspects that broaden perspectives on service (including outcomes, participants, and the value of service), lead and contribute to career and workforce development (including skills development and a focus on living wage jobs), and engage post-secondary education options (including connections to secondary education, completion of the first year of college, and relevant credentials). The engagement of national service investments as opportunities and pathways out of poverty. PACE is pleased to announce the release of it’s latest white paper, “An Inequitable Invitation to Citizenship: Non-College-Bound Youth and Civic Engagement”. A pdf version of the white paper is attached and we would urge you to share it widely with your colleagues and co-workers. Also, we will soon be announcing a webinar when the authors will discuss their research and findings. PACE is pleased to announce the appointment of two new board members. John Dedrick, Vice President and Program Director at the Charles F. Kettering Foundation in Dayton, Ohio and Michael Smith, Vice President, Social Innovation at The Case Foundation in Washington, DC have both agreed to join the board of PACE. PACE also wants to thank Ben Binswanger of the Case Foundation for his important service on our board, his contribution to this organization’s growth over the past three years has been invaluable. On September 9th, PACE co-sponsored ‘Engaging Citizen 2.0: From Obama to the “MyFaceTube” Revolution, How is Social Media Reshaping Civic Engagement?’ with the Case Foundation and the National Conference on Citizenship. The meeting, held at the Library of Congress in Washington, DC, catalyzed an important conversation about how the philanthropic and non-profit communities are utilizing new forms of social media. Attached is a short video that captures some of the energy of the conference. PACE, Philanthropy for Active Civic Engagement and the National Civic League have teamed up to publish a special issue of the National Civic Review (NCR) on cutting edge forms of dialog, deliberation and public decision-making at the local government level. Currently in its 98th year of publication, NCR is one of the nation’s oldest and most prestigious journals of civic affairs. Its audience includes mayors, city managers, community activists, academics and leaders within the nonprofit sector. Released this week, “The New Laboratories of Democracy: How Local Government is Reinventing Civic Engagement” features essays, interviews, and case studies on cutting edge practices by villages, towns, cities and counties in the field of public participation and how nonprofits and foundations are aiding and assisting those efforts. What factors led to this flurry of experimentation? What forms did these new methods take? What have we learned about these new approaches? How do public officials ensure these new ways of doing civic engagement avoid the old trap of offering only the “illusion of inclusion?” And how will technology change the way citizens come together to solve problems? These are a few of the questions raised and explored in a white paper issued by PACE in May. This special NCR issue includes examples, insights and recommendations contained in the earlier report as well as essays by leaders of public sector associations such as the International City/County Management Association and the National League of Cities, on-the-ground reports from practitioners and advocates of civic engagement who work in communities, and “lessons learned” from local government managers who work with neighborhood groups and public forums. To receive a complimentary print edition of this issue (NCR 98:2), contact Kristin Seavey, kristins@ncl.org, 303-571-4343 (ph), 303-571-4404 (fax). But good afternoon, and I am delighted and honored to be here to celebrate with you. I want to thank Mayde for that kind introduction. We did get to spend a lovely lunch together, and she tasted some of the fruits of the garden. They were good. (Laughter.) I also want to thank, as I kindly referred to them as the two Matts — Matt Schuyler, who’s the current chair, and the incoming chair, Matt Mitchell, for their hard work. I got a chance to meet them backstage. So I’m just delighted to be able to join you all today, and I’m here simply to say thank you for the work that you’ve done and to help celebrate all of your accomplishments, the work that you’ve done to help make D.C. a truly wonderful community. It has been so nice to call this city our second home. As you know, the President has said that America is facing some of the greatest challenges it’s faced in generations, and as a result, Washington can only do so much. I think probably each and every one of you in this room realizes that. There’s only so much that government can do. As has been the case throughout our history, communities are built and rebuilt by regular people: folks working in businesses, philanthropists, foundations, and volunteers, all of them coming together to find solutions to these types of challenges. And during this time we are going to need everyone, and that — everyone to rededicate themselves to this type of community-building, and we’re going to need people to basically take hold of this kind of ethic of service and make a personal commitment to helping get this country back on the right direction. And I believe that we’re in a unique moment in history. Maybe you’re seeing the same thing. I’m feeling it as I’m traveling not just around D.C. but around the country. But people really want to get involved. They really want to. They’re looking for a way to turn their frustration, excitement, anxiety into action. And the recent passage of the Serve America Act — the federal government is tripling its contribution to volunteerism, and people are responding to that investment. Applications, as we’re seeing for service opportunities, are up by record numbers, and that’s a very good thing. And with the knowledge that, as Barack said throughout his campaign and throughout his presidency, that ordinary people can do some extraordinary things if they’re given the proper tools and support, my husband is asking us to come together to help lay a new foundation for growth. And that’s really where all of you come in, where you’ve been coming in for years and years and years through your work. In order to make service a part of every citizen’s life, we need to ensure that we have the capacity to welcome those volunteers in. And that’s easier said than done. We want to be able to put folks’ goodwill into good use. We need to make sure that every hour of time that they commit is spent doing something that’s actually going to make a difference, that every dollar contributed is actually going to go to moving some real solutions forward. And I realize that that’s easier said than done. Having built an organization myself from the ground up — as you heard from my background, I’ve kind of floated through my career, building stuff and then moving on and building something else — I know what non-profits, foundations and social entrepreneurs face. I understand it. I know how hard it is to get the money to pay for fundraising, and accountants, and volunteer coordinators, to get all the technology that you really need to make the work happen; that this just doesn’t happen out of goodwill, that it takes real resources to move things forward. And I know what it’s like to worry about making payroll, which I know many of you are going through in these tough times. I know that you’re laying off consultants and staff members because you’re seeing dollars dwindle. I know what it’s like to write need statements and come up with measurable outcomes and — (laughter) — yes, we all know that — segregating funds, completing AmeriCorps progress reports. I’ve done all that. And it’s necessary, but at times it can drive you nuts. (Laughter.) So I know that service doesn’t just happen. And I know how hard you work behind the scenes to make it happen, and a lot of times people take it for granted because if the work is getting done, then nobody really cares how. And when it stops happening, they wonder why, but often don’t have the resources to step in. So I want to congratulate you all on doing what it takes to make these programs work, and just knowing what it takes to keep the operations going that you don’t even get a chance sometimes to celebrate what you’ve done to realize to step back and look at the impact that you’re having. So I honor all of you for the effort, and hope that you can, if not today but tomorrow and in the coming weeks, pat yourselves on the back for the work that you’ve been doing, because we’re going to need you to do even more. When I look over this room, I think about my days when I worked at Public Allies. I headed that program in Chicago before I moved into the university, and that organization allowed me to work with more than 30 Chicago organizations every single year, placing AmeriCorps members with them so that they could expand their services. We placed young people with organizations working on education and youth development groups, environmental groups, neighborhood, economic development groups, all types of groups all throughout the city of Chicago. And I saw first-hand through that work the variety of neighborhood and community needs that exist out there, and how hard it is for these groups to meet that need with the resources that they have. So they were excited to get these young people. However naïve and untrained they were, they ate these Allies up. And we recruited some of the best kids across the city of Chicago. For every young person that we recruited at a great institution like Northwestern, DePaul or the University of Chicago — we even recruited kids from Harvard Law School — we also recruited someone from Cabrini Green or from Little Village or North Lawndale. And through my work with Public Allies I realized that the next generation of leaders was just as likely to come from poor and working-class neighborhoods as they were to come from some of the top colleges around the country. My time at Public Allies also gave me the opportunity to work with John McKnight and Jody Kretzmann, who developed the Asset-Based Community Development approach to neighborhood development, and that really influenced how we worked with communities. Some of you may be familiar with this approach, but the approach acknowledges that all of us, every single one of us breathing in this community, in this planet, those of us serving and those of us who are being served, that we’re all both half-full and half-empty. We all have skills and talents that make us good friends, family members, workers, and leaders, and we also have needs and shortcomings that come along with those strengths. We can’t do well serving these communities, I learned with Public Allies, if we believe that we, the givers, are the only ones that are half-full, and that everybody we’re serving is half-empty. That has been the theme of my work in community for my entire life — that there are assets and gifts out there in communities, and that our job as good servants and as good leaders is not only just being humble, but it’s having the ability to recognize those gifts in others, and help them put those gifts into action. Communities are filled with assets that we need to better recognize and mobilize if we’re really going to make a difference, and Public Allies helped me see that. At Public Allies, we endeavored to do this also by bringing these young people together from diverse backgrounds. We worked with African Americans, Asian Americans, Latinos, Native Americans, white, gay, straight, you name it, college graduates, ex-felons, we brought them all together every week to work in a group. And truly, that’s where the magic happened, when you saw those kids from all those different backgrounds really tussling it out and trying to figure out their philosophies in the world in relationship to their beliefs and stereotypes. The law school graduates realized they had a lot to learn about how communities really work and how to engage people. There’s nothing funnier than to watch a kid who believes they know it all — (laughter) — actually come across some real tough problems in communities that test every fiber of what they believe. And then you see the young person with a GED realize that they could go to college because they’re working with kids who are just as smart or not smart as them who are going, and they gain a sense of the possibilities that they have. They know that their ideas are just as good, sometimes even better. That’s when those lights go off. That’s what we think about when we think of Asset-Based Community Development — that a kid from Harvard and a kid with a GED are both full of promise. Everyone learned to build authentic relationships with one another where they could recognize each other’s strengths and provide honest feedback on their challenges. They gained a blend of confidence and humility that prepared them to be able to lead from the streets to the executive suites. You could take any one of those Allies — and it’s not just Allies, there are kids like this all over the country, and you could plop them down in any community, and they would know how to build relationships. You know, that’s not just important in non-profit, that’s important in life. These are the kind of gifts that we can give people through service. And as we move forward to implement the Serve America Act, my hope is that the Office of Social Innovation that’s going to do some of this funding will help us identify the wonderful concepts out there like Asset-Based Community Development. There are other wonderful approaches out there that are working in communities all over this country. This office hopefully will identify more of them and help them grow and develop the best solutions, and replicate those ideas throughout the country. I also hope that these efforts will help us encourage philanthropy that is more responsive to the needs of the organizations. I was fortunate at Public Allies Chicago to have some pretty significant major investors — multi-year grants, as we called them back then. I guess they still exist. (Laughter). But when you have that kind of long-term investment from foundations and corporations, that allowed me to do things like hire a development staff, or an office manager, to pay for technology that would help support this work. And you know, again, this work doesn’t happen by itself. You need staff and resources to do it. That core of organizational support made it possible for me to meet those measurable outcomes, and I hope that more philanthropists in this time will step up and have a longer-term investment approach to organizations like yours, because effective outcomes come from effective organizations, and if we are able to shed some light on the work that you’re doing and the need for financial support, we can get the foundation community thinking even more critically about building the sustainable kind of support over time. We need foundations and philanthropists to provide the integral support for our community organizations. But we also need those community organizations to provide support for all these volunteers we’re recruiting now. We need to harness this amazing amount of goodwill that we’re generating through this administration in a way that ensures that we serve all Americans to the best of our ability. So once again, we’re going to need you. As tired as you may be, we’re going to need you. So that’s why I’m here — (laughter) — to say thank you, because we’re going to be tapping you more and more. (Applause.) Now is the time that we have to connect with one another and share good ideas and hold each other up and give each other that private counsel when the dollars are running short and hope is a little harder to find. But that’s why times like this, opportunities to gather and celebrate, are important to just get us back on track. Right now we are going to be channeling hopefully thousands of volunteers in your direction. America is looking to engage. But as you know with volunteers, if they’re not connected to something meaningful, if their experience isn’t organized and makes sense, then we lose them forever. So we hope to be able to provide some of the resources that you need, but we also need you to prepare for the challenge. And if we do that and continue to harness this energy, we can not only change the way this nation feels about service, but we can change the way the world sees us. So many people will need a place to funnel their talents and their energies. Volunteerism is one of those win-win situations that makes absolute sense in this point in our nation’s history. The Council on Foundations held their annual conference in Atlanta May 2-6. While the turnout was expectedly below that of previous years, the conference had many valuable sessions and the smaller size of the gathering (roughly 1,100 people attended) made for more productive networking. Steve Gunderson, the President and CEO of the Council, delivered a thought-provoking speech at the conference’s opening plenary which framed his view of the field of philanthropy and its role in societal problem solving. You can view the speech, “Philanthropy’s Place: Today and Tomorrow” (Word Doc) here. PACE is moving forward on an intensive research project to document, analyze and disseminate information on cutting edge civic engagement efforts by local government. The research is part of a two-year project supported by the Kellogg Foundation to examine new models of public engagement. Towns, villages, cities and counties are rich sources of civic innovation, but many success stories and new models go unheralded outside the small circles of people who follow the ins and outs of local government. One of our first discoveries in this research was the lack of any central clearinghouse or database to identify and assess the scale and impact of these local efforts. Literally thousands of communities have become “laboratories” of civic experimentation and change. Their efforts vary in scope and nature. Some are temporary, designed to solve a specific problem or to forge a new community “vision” for the future. Others, like the Neighborhood Councils in Los Angeles, reflect long-term structural changes that influence the day-to-day operations of city departments. Local innovation has been driven as much by necessity as by any abstract sense of mission or idealism. During the late 1970s, two trends converged to create a greater demand for civic experimentation. The first was an increase in grassroots, community organizing and passionate, single-issue advocacy. The second was a growing skepticism about government, its ability to solve problems and an organized opposition to tax increases. As citizens were demanding more for less from the public sector, outside sources of funding, notably state and federal “block grants,” were drying up. Consequently, many local officials had no choice but to seek news way of interacting with the public. The alternative was dysfunction and paralysis. Another development was the proliferation of new state and federal mandates governing everything from environmental protection to land use planning. These laws typically included vague language about public participation, but in many communities, planners and city officials designed processes that went far beyond the mandates. Technology is clearly an important change factor and a big unknown in the future of civic engagement. Computers give citizens instant access to a wide range of information and provide new forums for policy discussion. Web-based “citizen journalists” are adding new, if often discordant, voices to the marketplace of ideas, while government agencies are finding innovative ways of using the Internet to inform and engage the citizenry. People are better informed than ever but also, in many cases, more physically isolated. Managers and elected officials who want to succeed must find effective ways of communicating and convening to tap the potential of technology. A first step in this project was to interview experts in the field, scan the available literature and search newspaper indexes and other databases for recent examples of civic change. Terry Amsler, director of the Collaborative Governance Initiative at the Institute for Local Government, a nonprofit research and resources arm of the League of California Cities and the California State Association of Counties, sees “an explosion of experimentation in civic engagement” from Chula Vista, a modest border town near Tijuana, to the affluent suburbs of the Silicon Valley. Local government has undergone a sea change in the way it views the public. The signs are everywhere. For instance, instead of having a marketing and communications department, the City of Ventura, California, now has a “Division of Civic Engagement” with a website featuring streaming video of public meetings, a city manager’s blog and “portals” to learn more about civic events, local news and volunteer opportunities. Also, public administration and policy programs at universities have adopted the language and values of civic engagement in their curricula. Clearly, there is a rich brew of experimentation going on at the local level. In fact, there are so many stories of civic change that, initially, the difficult question was where to start. Many different fields and disciplines come together in an inchoate mass known as civic engagement, including conflict resolution, government reinvention, leadership development, strategic planning, opinion polling, urban design, and environmentalism. All of which make our research project both challenging and potentially more rewarding for our audience of funders, practitioners, local officials, academics and informed citizens. –Our W.K. Kellogg Foundation supported, two-year research effort is now moving forward. This project will examine new models of civic engagement in two to four fields. Each field will involve a separate research project and written report. The possible topics for this research effort include new models of how local governments are involving citizens, new ways that community foundations are listening to and involving the communities they serve, new ways that citizens are being engaged in the planning of large land use projects and the broad field of how young people are being engaged in public life. –Our Case Foundation sponsored research project has been further refined and is now moving forward. The research paper will focus on better understanding how young people who have just entered the work force are being engaged in different aspects of public life. We’ll look at both high school students directly entering the work force and college students who have just graduated. There will be a particular emphasis on how new forms of communication technology are aiding in these efforts. Our hope is to have several products ready for dissemination by the fall. –PACE, along with the Funders Committee on Civic Participation (FCCP) are serving as co-sponsors of a Proteus Fund gathering entitled “Funding Strategies for a Broader, Integrated Democracy Agenda”. The meeting will take place on September 10th and 11th at the Johnson Foundation’s Wingspread conference center. The meeting is part of the Proteus Fund’s research project being managed by Larry Marx. Larry has been asked by Proteus to ‘map’ the democracy field, and to explore whether an overarching approach would be better than single-issue approaches. He convened a meeting of advocates, experts and a few funders in mid-May in Chicago at the Joyce Foundation and as a result of that meeting, and many interviews, has now developed a preliminary report which would be discussed and refined at this meeting. –On June 12th and 13th, board member Chris Kwak of the W.K. Kellogg Foundation and Executive Director Chris Gates represented PACE at a meeting in Washington, DC convened by the Philanthropic Initiative for Racial Equity (PRE). The purpose of this meeting was to bring together board and staff from eight different affinity groups to discuss the issue of structural racism and to explore how each of these groups could do racial equity work within our grantmaking networks. PACE particiapted in this meeting because it feels there is a clear race/diversity component to much of the field of civic engagement and democratic renewal. Chris K. and Chris G. will bring ideas to the PACE October board meeting in Chicago about how PACE can become more involved with this issue. –GuideStar has a ‘membership guild’ consisting of 42 foundations and corporate giving programs, they have a quarterly on-line newsletter called TrueNorth and they have included a link to ‘Power To The Edges’ (an article on the PACE website) in their June edition. –Chris Gates has been asked to serve on the Executive Committee of the Affinity Group Network (AGN) for the next year, he officially joined the Executive Committee at the annual meeting of AGN in Washington on July 30th and 31st. –Conference planning continues for the 2008 Council on Foundations ‘Philanthropic Summit’. PACE Executive Director Chris Gates is serving as a member of the 2008 Planning Committee and has been working to increase the involvement and representation of affinity groups in the conference. The next full meeting of the committee will take place on September 19th and 20th, immediately after the community foundations conference in San Francisco. –PACE has signed on as a co-sponsor of a new initiative called ‘Common Vision’, which is being organized by Funders for Lesbian and Gay Issues. Seven other affinity groups have also signed on as co-sponsors. As the project unfolds we will see if there are more specific things that we can do to be helpful. ‘Common Vision’ is a two year learning process designed to promote equity and opportunity in philanthropy. –PACE Executive Director Chris Gates continues to travel and speak extensively around the country. Later this month he will facilitate a leadership seminar at the Aspen Institute featuring Denver Mayor John Hickenlooper, and in September he’ll be speaking at the University of Kansas in Lawrence, at the Theater Bay Area conference in San Francisco, and at the Pioneer Leadership Program in Denver. –PACE is working with Northern California Grantmakers and several northern California funders to sponsor a half day program with Allison Fine on November 6th. The session will take place in the Silicon Valley and will focus on how new forms of communication technology have affected civic life in America. More details will be forthcoming soon. Chris Gates, president of the National Civic League, has been named executive director of Philanthropy for Active Civic Engagement (PACE). Continuing his longtime commitment to promoting individual participation in community affairs, Gates will support PACE’s mission to inspire interest, understanding, and investment in civic engagement. This weekend he will speak at a session on state initiatives to advance active civic engagement. Hosted by PACE and the Henry M. Jackson Foundation, the event is scheduled for 9:00 a.m. on Sunday, May 7, as a pre-conference discussion at the Council of Foundation’s annual conference in Pittsburgh. Gates is a leader and frequent speaker in the areas of democracy, the interaction between citizens and government, and innovative community problem solving. He serves on a variety of boards, including the Council for the Advancement of Citizenship, the California Center for Civic Renewal, and the Institute for the Regional Community. He is also a fellow at the National Academy of Public Administration, co-chair of the Civic Practices Network, and a co-chair of the Saguaro Seminar, a Harvard University project studying social capital. Gates has a master’s in public administration from the John F. Kennedy School of Government at Harvard University, where he studied the interaction between the public and private sectors, and an honors degree in economics from the University of Colorado at Boulder. He was also a visiting scholar at the University of East Anglia in Norwich, England, where he studied political economics. Philanthropy for Civic Engagement (www.pacefunders.org) is a community of grantmakers and donors committed to strengthening democracy by using the power, influence, and resources of philanthropy to open pathways to participation. Investments—Read the Latest Issue in Our Series! “improvements” on the concept as presented by Davenport. willingness of elected officials to delegate their own authority. Assembly – how would you ensure it was truly representative? need for an Academy that would prepare citizens for this responsibility. as campaign finance reform, redistricting and electoral reform. from existing efforts to reform our political system and process. to participate or prodding? Do we need leadership or encouragement? What do you think? Let’s keep the conversation in play. THE LATEST ISSUE IN OUR SERIES! response to the devastation of Hurricanes Katrina and Rita. to read the Winter 2006 issue of Profiles of Engagement Investments. ground in New Orleans, making plans for a better tomorrow. generate and improve media coverage of issues exposed by Katrina. and lessons learned about the handling of natural and man-made disasters. be regularly added to the Philanthropy Northwest website at www.PhilanthropyNW.org. candidates and are aiming to complete this process by late spring.